SAN FRANCISCO BAY AREA, California (September 20, 2017) – From September 30th through October 14th, 2017, a delegation of Indigenous women from across the United States who have been at the forefront of the Dakota Access Pipeline (DAPL) resistance effort and other movements to stop fossil fuel extraction and infrastructure which pose threats to Indigenous and human rights, self-determination, lands and culture will travel to Norway, Switzerland and Germany. The delegation will urge financial institutions to divest from and cancel credit facilities with pipeline companies that endanger rights and neglect Indigenous People’s right to Free, Prior, and Informed Consent (FPIC) as outlined in the United Nations Declaration on the Rights of Indigenous Peoples. Norway, Switzerland and Germany house several of the world's largest financial institutions that, through either corporate level or project level finance, support dangerous extraction projects across Indigenous territories in the U.S. and globally - making these countries vital locations for frontline and impacted women leaders to engage directly with banks, public officials, civil society groups, and media. The Autumn 2017 Indigenous Women's Divestment Delegation, facilitated by the Women’s Earth and Climate Action Network (WECAN) International in partnership with Indigenous women leaders and their directives, is part of a growing movement that has found the pursuit of institutional divestment to be an effective strategy to hold banks and fossil fuel related companies accountable to indigenous rights and protection of land, climate and water. 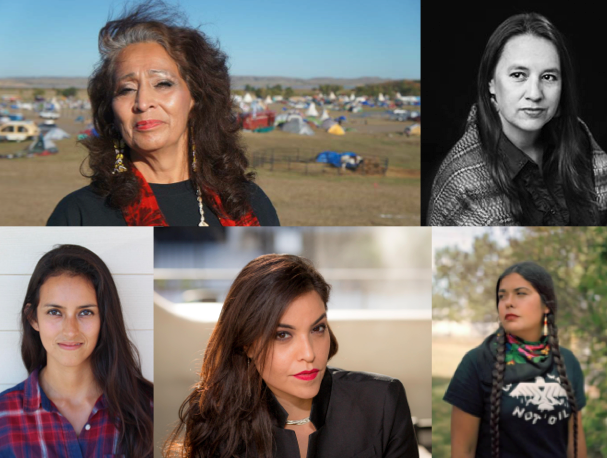 Autumn 2017 Indigenous Women’s Divestment Delegation members include - LaDonna Brave Bull Allard (Lakota historian, member of the Standing Rock Sioux Tribe and founder/landowner of Sacred Stone Camp); Dr. Sara Jumping Eagle (Oglala Lakota and Mdewakantonwan Dakota pediatrician, living and working on the Standing Rock Reservation, North Dakota); Jackie Fielder (Mnicoujou Lakota and Mandan-Hidatsa, Campaign Coordinator of Lakota People's Law Project and organizer with Mazaska Talks); Michelle Cook (Diné/Navajo, human rights lawyer and a founding member of the of the Water Protector Legal Collective at Standing Rock); and Tara Houska (Anishinaabe, tribal attorney, National Campaigns Director of Honor the Earth, former advisor on Native American affairs to Bernie Sanders); along with Osprey Orielle Lake (WECAN Executive Director and delegation facilitator). In addition to advocating for fossil fuel divestment and investment in a renewable energy future - delegates will share vital updates regarding the Dakota Access Pipeline, the growing pipeline resistance by Indigenous peoples and allies to Keystone XL (TransCanada), Trans Mountain (Kinder Morgan), Energy East (TransCanada), and Line 3 (Enbridge) pipeline projects; and the success of municipal divestment campaigns across the United States. The Delegation will be based in Oslo, Norway from September 30 - October 4; in Zurich, Switzerland from October 5 - 10; and in Munich and Frankfurt, Germany from October 11 - 14. Press and media are encouraged to reach out to WECAN International to schedule interviews.